MEXICO, NY â€“ Oswego County Opportunities opened the doors of its new Community Service Center in Mexico to showcase the new facility to community members during a special open house and ribbon cutting ceremony. More than 120 people attended the event and had the opportunity to tour the building and learn of the many benefits that it will provide to both the community and OCO. A number of state and county officials along with representatives from the Mexico Chamber of Commerce and more than 120 community members joined Executive Director of Oswego County Opportunities, Diane Cooper-Currier, and OCO staff to celebrate the opening of OCOâ€™s new Community Service Center on Scenic Avenue in Mexico. Director of OCOâ€™s Senior Nutrition Services, Amy Roland was impressed with the turnout and was happy to greet the community. â€œIt was wonderful to see the communityâ€™s interest in our new center and have the opportunity to share with them OCO’s mission of building partnerships that improve the quality of life and create successful communities,â€ she said. On hand for the festivities May 26 were representatives of government and the business community, including: Larry Schmidt, director of the Oswego County Office for the Aging; John Proud, 7th District Oswego County legislator; Barry Leeman, chairman of the Oswego County Legislature; J.P. Scullin, representing NYS Senator Darrel Aubertine; Jennifer Cook, representing NYS Assemblyman William Barclay; and members of the Mexico Chamber of Commerce. 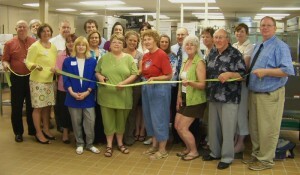 Located on Scenic Avenue, OCOâ€™s Community Service Center is the cornerstone of OCOâ€™s Senior Nutrition Services. The 6,500 square foot building is home to a brand new, state-of-the-art, kitchen that is used to prepare meals for OCOâ€™s Senior Nutrition Services as well as conference rooms and offices for staff. The center also provides opportunity for future expansion of services to the Mexico community. A second phase of renovation will transform approximately 1,000 square feet of the building for a variety of community services including: recreation and education activities for youth, support services for children, youth and families, meal service for children and family programs, and an access portal for consumers seeking any of OCOâ€™s many services. â€œWe built this new Community Service Center with room to grow so that we will be able to offer additional, much needed nutrition services and have the potential to utilize it for multiple menus. The second phase of this project will provide surrounding communities with easy access to the more than 50 services that OCO provides,â€ added Roland.